The Naitional Banner o Pakistan (Urdu: پاکستان کا قومی پرچم‬‎) wis adoptit in its present form durin a meetin o the Constituent Assembly on August 11, 1947, juist three days afore the kintra's unthirldom, when it became the offeecial banner o the Dominion o Pakistan. It wis efterwards retained bi the current-day Islamic Republic o Pakistan. The banner is a green field wi a white crescent moon an five-rayed starn at its centre, an a vertical white stripe at the hoist side. Tho the green colour is mandatit ae as 'dark green', its offeecial an maist consistent representation is Pakistan green, which is shadit distinctively darker. The banner wis designed bi Amiruddin Kidwai, an is based on the All-Indie Muslim League banner. The banner is referred tae in the naitional anthem as Parcham-e-Sitāra-o-Hilāl in Persian (lit. banner o the crescent an starn). It is flewn on several important days o the year includin Republic Day an Independence Day. A designer named Amiruddin Kidwai studied the League’s banner, as he tried tae design a banner for a new, independent naition. Finally he arrived at a design, an he presentit it tae the men who wad run the new Pakistan govrenment. The Pakistan govrenment adoptit his design on August 11, 1947. The Pakistan govrenment haes pronoonced rules aboot the flyin o the Pakistan banner. The govrenment haes cawed for display o the banner at full mast on Mairch 23 o each year. That display recognises baith the adoption o the Lahore Resolution in 1940 an the Declaration o the Republic o Pakistan in 1956. banner raisers in Pakistan an aa mak a pynt o hoistin the banner each year on the fowerteent day o August. That is considered tae be Pakistan’s Independence Day. Pakistan became free o Breetish control on August 14, 1947. Afore the Seicont Warld War, Muslims an Hindus lived thegither unner the Breetish Raj. A nummer o the Muslims formed the All Indie Muslim League. Efter the Seicont Warld War, when the partition o Indie led tae the creation o Dominion o Pakistan, the banner o the Muslim League served as the basis for the banner o Pakistan. The green represents the majority Muslim community in Pakistan, whauras the white stripe represents releegious minorities. In the centre, the crescent an starn seembolise progress an licht respectively. The banner seembolizes Pakistan's commitment tae Islam, the Islamic warld, an the richts o releegious minorities. It is based on the oreeginal banner o the Muslim League, which itself drew inspiration frae the banner o the Sultanate o Delhi an the Mughal Empire in Indie. ↑ "Pakistan Flag specification: Resolution Passed by Constituent Assembly". Pakistan.org. Retrieved 2007-12-11. ↑ "Parliamentary History". National Assembly of Pakistan. Archived frae the oreeginal on 2007-10-24. Retrieved 2007-12-11. ↑ "Parliamentary History of Pakistan" (PDF). Parliamentary Division, Government of Pakistan. Archived frae the oreeginal (PDF) on 2008-02-16. Retrieved 2007-12-11. ↑ "Government of Pakistan: Flag description". Pakistan.gov.pk. Retrieved 2007-12-11. ↑ 5.0 5.1 "Pakistan flag". Ministry of Information and Broadcasting, Government of Pakistan. Retrieved 2007-12-11. ↑ "Basic Facts". Ministry of Information and Broadcasting, Government of Pakistan. Retrieved 2007-12-11. 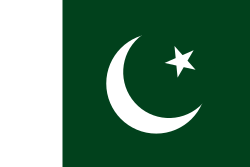 Wikimedia Commons haes media relatit tae Flags of Pakistan. This page wis last eeditit on 6 Mairch 2018, at 08:14.